This book provides an introduction to concurrent, real-time, distributed programming with Java object-oriented language support as an algorithm description tool. It describes in particular the mechanisms of synchronization (cooperative and competitive) and sharing of data (internal class, static variables) between threads in Java. He then discusses the use of Java for real-time applications. 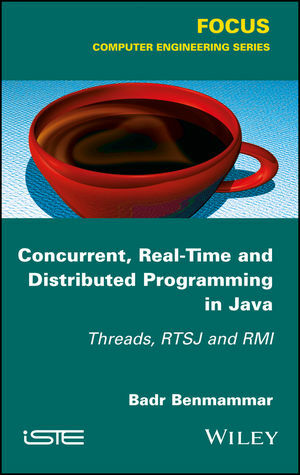 Consequently, a presentation of the RTSJ (Real Time Specification for Java) specification dedicated to the development of real-time applications in Java is also introduced in this book. Finally, a presentation of programming distributed in Java is presented in this book. We are particularly interested in communication using the TCP Sockets and high-level communication using Java Remote Method Invocation (RMI). The book also contains an annex which contains a practical set of application exercises in relation to the theme of the book. Knowledge of the Java language is a prerequisite for understanding the book. 1. Introduction to threads in Java. 3. Real-time systems and real-time Java. 4. Distributed Programming in Java.